There are two designated parking spaces for Orange Badge holders directly outside the front of the cinema, advance booking is recommended. Windsor Street Car Park has ample spaces for Orange Badge holders. The cinema has many facilities installed for people with disabilities. 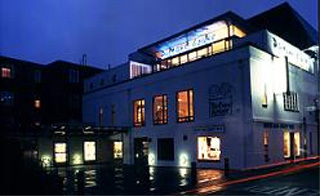 The ground floor entrance to the Picture House has flat, level access and automatic doors, which open into a lobby. This contains a lift to all floors, and a flight of stairs to the first floor box office and kiosk. The fully accessible toilets are operated by RADAR keys, obtainable from staff. Those using the lift are requested to stop at the first floor to purchase their tickets before proceeding up to the second floor where the bar and auditoria can be reached. There are low level call points situated outside the main entrance, and between the ground floor lift and the accessible toilet, should you require assistance. The box office, kiosk and bar all have dropped counters and accessible levels for transactions. Screen One has four wheelchair spaces, and Screen Two has two, with a choice of seating. Advance reservation is recommended so that the wheelchair space can be prepared. Guide Dogs are welcome. There are tactile aids on the handrails, indicating the number of stairs remaining before floor level is reached. The lift has voice announced arrival, state of doors information and tactile aids on the controls. The pay phone is equipped with an inductive coupler to assist users with hearing aids, and an induction loop system is fitted in each cinema.